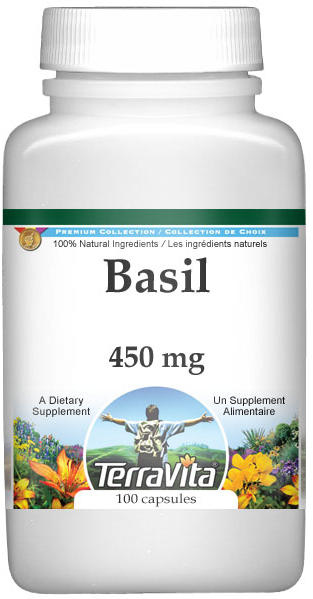 In his Family Herbal, John Hill states, "Basil is little used for health, but it deserves to be much more. A tea made of the green plant is good against all obstructions. No simple is more effectual for gently promoting the menstruation, and for removing the complaints which naturally attend their stoppage:" In old herbal literature, crushed leaves can be used to help support the stings of bees and scorpions. Basil can be used to help support mild nervous disorders and rheumatic pains. A snuff of the dried leaves can be used to help support nervous tension headaches. In Central America, 0. basilicum is put into the ears to help support deafness. The Chinese use basil to help support stomach spasms and kidney ailments, and to help promote blood circulation before and after childbirth. Mexican s use basil for menstrual and labor pains. For earache, the powdered leaves are steeped in olive oil. 0. basilicum has stomachic, tonic, carminative, galactogenic, emmenogogic, and gastric antispasmodic qualities. The essential oil of basil contains delta-linalool and estragole as the main components, with varying amounts of methyl cinnamate, eugenol, borneol, ocimene, geraniol, anethole, safrole, camphor, and other components. Concentrations of these chemicals vary greatly depending upon the species, variety, time of harvest, soil, and weather conditions. Basils having a strong clove scent contain high amounts of eugenol-clove bud oil contains up to 90 percent eugenol. Basil oil reportedly has worm expelling qualities. The oil is used commercially for fragrance in perfumes, soaps, toothpastes, mouthwashes, and in flavoring liqueurs such as chartreuse. Basil is probably the most widely cultivated herb in gardens. The genus Ocimum is represented by over 160 species of annuals and short-lived perennials native to warm temperate regions of Asia, Africa, and South and Central America. Ocimum basilicum and its large-leafed 'Italian' and 'Lettuce Leaf' varieties are extensively cultivated in the United States. Most seeds sold as sweet basil are usually one of these varieties. 0. basilicum is an erect, branched annual and grows three feet high. The leaves are bright green, smooth, oval, and acutely pointed, with entire or slightly toothed margins. Leaves of 0. basilkum are about 1 to 2 inches long, though the leaves of the lettuce leaf variety may reach four inches in length. Flowers are arranged on racemes. They are one-fourth to one-half inch long, in whorls (verticillasters) of six flowers, with two opposite groups of three flowers. The whorls may be compact or spaced some distance apart. Two tiny leaf-like bracts are arranged opposite one another below each whorl. The cup-like calyx has a broad, rounded upper lip, its margin curving upward. The lower lip has four sharp pointed lobes, two on the sides and two at the lower edge. The flowers are white to purple in color, with broad four-lobed upper lips and a narrow four-lobed lower lip. The black seeds are about one-sixteenth of an inch in diameter and produce mucilage when soakd in water. Ocimum basilicum 'Purpurascens purple basil', has deep purple stems and leaves sometimes mottled with green. The flowers are lilac toward the centers, becoming a paler white-lavender on the flower's edges. The cultivar 'Dark Opal': developed in the 1950s at the University of Connecticut, is consistently purple with no mottling. Ocimum basilicum 'Citriodora', lemon basil, has a pleasing citrus scent. It grows to be about a foot tall and has small leaves about five-eighths inch wide and 1 inches long. This tender annual hails from Southeast Asia and Australia. a kilimandscharicum, camphor basil, is a tender perennial native to tropical Africa, growing more than three feet high. The leaves have a strong camphor odor and are about one inch wide and three inches long. This is a good perennial for southern climates but will not survive a freeze. Unlike sweet basil, the leaves of this species have tiny hairs, giving it a grayish cast. It is best propagated from cuttings. The racemes may be up to one foot long. 0. sanctum, holy basil, is a native of Malaysia and India. It grows from one foot to two feet tall and has many branches. In India it is called tulasi and is venerated by the Hindus. Tn/an can be used as an amulet to protect the body in life and death and is a "giver of children". An immortal plant of the gods, it is worshipped in hymns and embodies perfection itself-the mystery of the creator is in the mystery of tulasi. According to Helen H. Darrah, author of The Cultivated Basilc, in the United States most seed sown as a sanchim or "spice basil" is probably a hybrid of 0. canum and O. basilicum var: True O. sanctum is seldom seen in gardens. O. gratissimum L., East Indian or tree basil may grow six feet tall in regions with no frost, and the hairy leaves may be as long as six inches with a width of 3 inches, though the plant seldom attains such size under cultivation in North America. Smaller forms grow from two to three feet tall. It has a strong clove scent. Basil is started from seed sown indoors in late March or early April, or directk in the garden as soon as the danger dfrost has passed and the soil has warmed up. Seed germinates in five to fourteen days, blooming begins eight to ten weeks after planting, and full bloom takes twelve to fourteen weeks. Seeds may rot in a cold damp soil. Seed may also slip up to the soil's surface after a rain because of the slippery coat produced by the mucilage in the seed. Sow to a depth of one-fourth to one-half inch. The seed will remain viable for over a decade if refrigerated. About six pounds of seed will plant an acre. Mix ingredients in blender starting out with the olive oil and about one-fourth of the basil and parsley. Slowly add the remaining ingredients. Serve cold on pasta or any of the foods mentioned above. Make basil vinegar for salads by placing one plant's leaves in a pint of your favorite wine, rice, or cider vinegar. Basil is high in vitamin A, vitamin C, calcium, and iron, and contains about 14 percent protein and over 60 percent carbohydrates.